Call of Duty: Infinite Warfare‘s third map pack has arrived on PlayStation 4, affording fans of futuristic combat the opportunity to explore a handful of new maps. Owners of the shooter’s $50 Season Pass can download the latest add-on for nothing, with those opting to go for an individual purchase required to drop $15 in order to access the new content. Whether or not you chose to do so likely comes down to how weary you’ve grown of Infinite Warfare‘s current suite of battlegrounds, but I have to say, Infinity Ward’s latest efforts certainly look up to par with the series’ more memorable war zones. 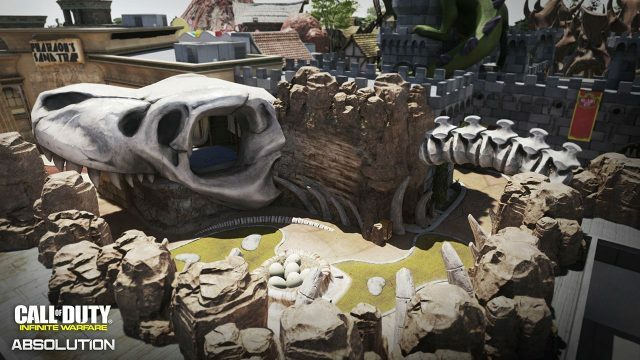 As revealed previously, Bermuda, Permafrost, Fore and Ember are the four competitive maps on offer this time around, all of which see soldiers deployed into an assortment of memorable, if slightly outlandish, arenas in which to do battle. If ferrying high-tech, oversized golf balls around a miniature golf course or creeping through dilapidated shantytowns doesn’t sound like your thing, though, there’s always Absolution’s continuation of Infinite Warfare‘s zombies’ campaign to get stuck into. Attack of the Radioactive Thing!, as it’s so called, trades space and haunted forests for a 1950s setting, complete with monster movie-inspired tropes and thematics. As previous chapters have done before this one, Radioactive Thing! features a guest appearance from actor Cassandra Peterson in character as Elvira. For those on Xbox One and PlayStation 4 eager to give Absolution a whirl, you’ll have to wait for Sony’s exclusivity deal with Activision to end, which usually concludes around the one month mark. As for what lies ahead for Activision’s storied franchise, Call of Duty: WWII, a return to the historical period that made the series’ name, is out later this year for consoles and PC. Head over here to see our early hands-on impressions, fresh from E3.